Are comfortable talking in front of a group, and good with children (most audiences are elementary students). Design a one-hour presentation with creative ideas, experiences, and materials to help children learn about the country. Please see our World Tour page for an outline of a typical session. Will attend a training session for presenters. 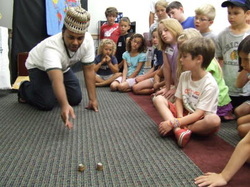 Kids and Cultures provides a facilitator for each session. This person will serve as moderator of the session and assist with any logistics during the presentation. After successfully completing the training session and one practice session, you will receive payment for each presentation. Kids and Cultures covers the expenses related to crafts and other activities. What do you consider your cultural heritage? What country(ies) and/or cultures have you experienced for an extended period of time (especially during childhood)? Please submit three craft ideas. We are looking for crafts that are simple enough for children to make, substantial enough so that they are not immediately thrown away, and relatively inexpensive. In the past, children have made clay bells/animals, decorated fabric squares, made masks, designed greeting cards, made simple musical instruments, painted designs on T-shirts, made bracelets, and folded origami. We are looking for three ideas of games that children commonly play in your country. The games could be played as a whole group, in small groups, or in pairs. Most settings have limited space, so do not list games that require the outdoors or large areas. Please note any equipment that is needed. We are looking for folktales that children in your country hear as they grow up. List the titles and brief descriptions of three possible stories. Alternatively, you could submit true stories from your childhood. We are looking for any other items that you can share from your expertise. For example, are you a dancer who can perform a typical dance? Are you an artist who can demonstrate a typical art style? Are you a musician who can sing or play typical music? Do you have artifacts that children can see and/or touch? Do you have typical clothing that you will wear or that the children can try on? What other ideas do you have for helping children learn about your country/culture? Please list the name of someone (not related to you) who can attest to your character and ability to fulfill the requirements of being a cultural presenter. Indicate your general availability for presentations, and the distance you are willing to travel.